Coral bleaching occurs when warmer-than-normal waters stress corals and cause them to expel the colorful algae that live symbiotically in their cells. A bleached coral is still alive, but is likely to die if the stress lasts too long. An estimated 30 percent of the world’s monitored reef formations have already perished as the climate has heated up. As reefs around the world have suffered bleaching events—including several that are still affecting large portions of Australia’s Great Barrier Reef—one group of filmmakers worked for nearly three years to document the devastation in real time and share it with the public. Filmmaker Jeff Orlowski joins coral researcher Ruth Gates of the Hawaii Institute of Marine Biology to discuss the story of coral in a warming climate, and what it might take to save reefs from further die-offs. Jeff Orlowski is the director of the documentary Chasing Coral. He is based in New York, New York. Ruth Gates is a professor and director at the Hawaii Institute of Marine Biology in Kaneohe, Hawaii. It’s estimated that as much as 30% of Australia’s Great Barrier Reef died last year, thanks to bleaching them. It’s a ghostly byproduct of warming and acidifying oceans that is afflicting reefs around the globe. The stressed coral turns white, and they often die. But in the new documentary Chasing Coral, ad man turned ocean activist Richard Vevers describes his first encounter with bleaching coral. RICHARD VEVERS: I was truly shocked by what I saw. The reef was white as far as the eye could see. Was this dead? Was it alive? 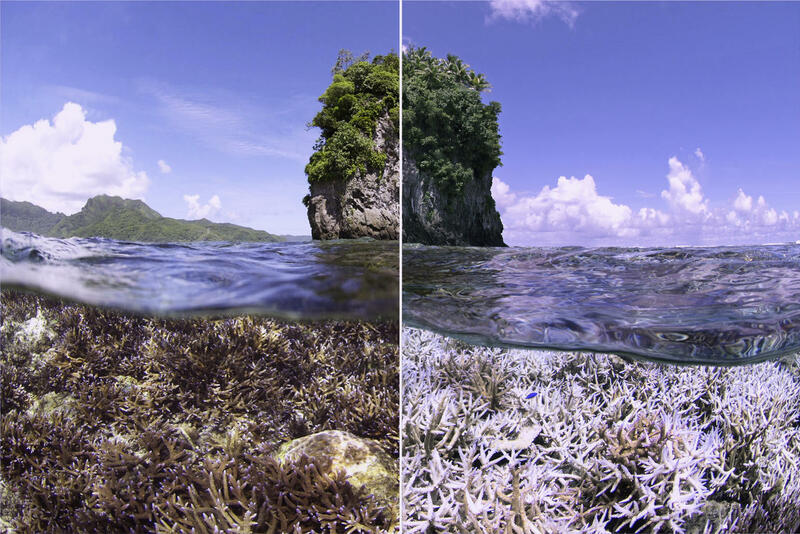 IRA FLATOW: Vevers is just one figure in Chasing Coral, which documents the scope of recent bleaching events in painstaking time lapses of reefs before and after they’ve bleached and died. The documentary is out today on Netflix and in selected theaters around the country. You can see a sample of that documentary on our website sciencefriday.com/reef. But the good news is that it’s not all bad news. The film’s director says he wants viewers to be inspired by this story. It’s not too late to act, he says. Like what if we could breed or teach coral to be more resilient to warmer waters? There are researchers working on just that, and I have a couple of guests here to talk about the story of coral, and why we should care, and some of those bits of hope. Let me introduce them. Jeff Orlowski is the director of Chasing Coral. Welcome to Science Friday. JEFF ORLOWSKI: Yeah, thank you so much, Ira. IRA FLATOW: You’re welcome. Ruth Gates is professor and director of the Hawaii Institute of Marine Biology in Kaneohe, Hawaii. Welcome to Science Friday. RUTH GATES: Thanks very much, Ira. IRA FLATOW: Jeff, you went from chasing melting glaciers to chasing bleaching coral. One is moving, you know, slower than the other? JEFF ORLOWSKI: Yeah, one moves a little bit slower, but the changes are all becoming faster than we anticipated. We had worked on a previous project documenting glaciers, and through that process, we met a bunch of scientists, and met some photographers, and started learning through Richard Vevers that subject that you mentioned. We started learning about what was happening in the ocean, and we realized we wanted to point our cameras literally under the water and document what was happening there. IRA FLATOW: Is one more convincing about climate change than the other, when you’re looking at both of them? JEFF ORLOWSKI: I actually do think so, very much so. In part, I think people who are on the fence about climate change– certainly the glacier story has been around for quite a while now. And people have their explanations. If they aren’t familiar with how fast the rates of change are happening in the Arctic, they might just rule it off and think that glaciers have always changed. They’ve always come and gone, and they might not get a sense of the time scales that the scientists are talking about. When you look in the ocean, and you look at the coral bleaching that’s happening right now, this does not fit any natural cycle whatsoever. And the changes are so dramatic, and they’re speeding up. And they’re happening so, so powerfully that it really can be this wakeup call that I hope people can view the footage of the film and see for themselves what’s going on. IRA FLATOW: Mm-hmm. Dr Gates, we saw major loss of the Great Barrier Reef in 2016. Give us a picture of how bad it is for coral worldwide. RUTH GATES: Well, it’s really bad. I mean, I recently gave a talk, and I said, had I given this talk a year ago or 18 months ago, I would have said 30% of the world’s reefs had died. But this year, we’re saying 50% of the world’s reef had died. That means we lost approximately 20% last year, during this very intense warming event that affected not only large parts of the Great Barrier Reef, but many, many other reefs worldwide. IRA FLATOW: Huh, and Jeff, describe to our listeners what a bleaching event looks like before and after. JEFF ORLOWSKI: Yeah, so very few people have gone scuba diving. It’s only about 1% of the world population. And before this project, I had never really spent much time underwater. A coral reef is an incredibly beautiful, colorful, biologically diverse ecosystem. And when the temperature starts to rise, those corals effectively get a little bit sick, and they basically turn transparent. You can see through to their skeleton underneath the coral animal. And that landscape now looks completely white. Just imagine walking through your nearby forest, and you went for a hike. You’ve been doing the same hike for years, and years, and years, and one day, you just go there, and all the trees have just turned white. It is startling. It’s shocking. It looks very, very strange. IRA FLATOW: Ruth, just to clarify, the fact that the coral is bleach doesn’t mean it’s totally dead– I mean, you’re dead, you’re totally dead– yet does it? RUTH GATES: No, that’s correct. I mean, really, it’s a race against time. So the higher the sea water temperatures, the longer the exposure of a coral to bleaching conditions, the more likely it is that that coral will die. And so you can have a very, very short but very extreme high temperatures that can kill a lot of corals very, very quickly. But sometimes, a bleached coral will recover if the temperature comes down. So large storms can come in and drop the water temperature very quickly, and that is a good thing for corals. IRA FLATOW: So why is the coral the part of the ocean we should worry most about under climate change? RUTH GATES: Well, we often talk about them as these places where lots of things convene. But really, what that means is 25% of organisms that live in the sea spend some time on a coral reef, because there are so many nooks and crannies that so many different types of things can live in. And many of those things end up on our plate– are critical to food security. 500 million people are directly affected by the presence of reefs. They’re also these incredible natural sea walls, so they protect the land behind them from major storms that come in from the open ocean. And that’s critical, because it really maintains the land that we live on. And so when a reef dies, the land directly behind them now is not protected and often erodes away. And many people live very close to the ocean, as you know, so that is very bad news for the people who live there. So these reefs, they serve so many fundamentally important purposes. And they are intimately linked to human health. IRA FLATOW: How much of the damage to the reefs comes from global climate change and how much from runoff from the land, let’s say in Australia? RUTH GATES: I mean, that’s a great question. And what we’ve observed is that the majority of the death or major losses in corals occur around these very large warming events that are– we’ve had one in 1998, in 2010, and now 2016. But they are made worse by the fact that the corals themselves are chronically stressed by things that happen just right adjacent to them. And you touched on the runoff from really large amounts of water coming on, and rain events, and pollution, and there’s been a lot of discussion of sunscreen. None of that is good. I mean, it’s like living in Beijing, where you’ve got like a haze of poor air quality. That’s what it’s like for a coral living close to humans that are polluting the water. IRA FLATOW: Jeff, why do you feel it’s important that people see this in real time? And you show it in real time. And let me just back up a second. Describe how difficult it was to actually film what you saw. JEFF ORLOWSKI: Yeah, for us, the challenge was figuring out where to be on the planet at the right time. So we worked with scientists like Ruth and scientists from NOAA using satellite data to predict where these bleaching events were going to happen. And then we took a specialty-built custom cameras that could do long-term time-lapses underwater in these conditions. And we went around the planet, and we deployed these camera systems to try to capture the before, during, and after process of the bleaching. And for me, this is a very visual landscape. Everybody has seen the underwater footage at some point in their life, because these landscapes are just so spectacular and so beautiful. And to be down there and to see the stuff happen, once you see it, it’s pretty hard to forget. And for us, we kept meeting scientists. We kept speaking with different experts who had seen what had happened, and they knew it was going on. And we wanted to be able to use film as a tool to capture that, so we could share it with the world. JEFF ORLOWSKI: Ruth, you want to start with that? IRA FLATOW: Ruth, can we bring these back? IRA FLATOW: Can we seed them with better warm water tolerant coral? RUTH GATES: There are two things that we can do. We can influence and change the things that are driving the coral bleaching. And of course, that’s the most important thing that we can do, which really involves the backing off on the reliance of fossil fuel burning and the embracing of renewable technologies and renewable energy. And it’s doable right now. It’s economically viable. It’s an easy thing for us to do. And frankly, that’s the most important thing that we can do. But as we get on with the doing that, we’re starting to explore how we can help the biology, the corals themselves, survive the warmer and more acidic water that is surrounding them at this time. And so we’re looking into whether we could potentially selectively breed corals that are apparently surviving conditions that are killing others. So there are two really very, very different approaches, and frankly, we would hope not to have to engineer the biology to survive a future that we have basically failed to keep in the limits that corals can survive in naturally. RUTH GATES: I mean, that is the easiest thing. IRA FLATOW: Have we reached the tipping point? I mean, is there a time where if we don’t do it by a certain number of years, that they’re going to be all gone? RUTH GATES: We are projecting that the majority of the world’s reefs will be dead by 2050, if we do not really start to address the drivers of climate change. When I say that out loud, Ira, I have to say it’s just heart-wrenching, because these systems are so beautiful. And frankly, the solution is so simple. It’s not that complex for us to lift this big collective effort that it will take to reduce fossil fuel burning. It’s just not that difficult. IRA FLATOW: And I know, Jeff, that you’re a great believer that once people get to really see this, this will be– as you say– more convincing than melting ice in Antarctica. And I know you do believe that people are totally oblivious to this, because it’s underwater. They don’t get to see this. JEFF ORLOWSKI: We did a film. Our previous film was called Chasing Ice, and we spent five years documenting glacial landscapes. And I thought I knew everything there was to know about climate change. And being exposed to the oceans, it was starting all over. Like I knew nothing about this, and I was shocked by how little I knew about this story. The biggest takeaway for me was that 93% of the heat trapped on the planet from climate change is being absorbed into the ocean. The ocean is just getting hotter and hotter. So if people are wondering about air temperature, and how much the air is changing, and how much– does one degree matter, does two degrees matter– when you think about the ocean absorbing heat, you can think of it like your own body, like your body temperature. So if the average temperature 98.6 degrees Fahrenheit, if your body goes up a couple of degrees, if you have a 101 or 102 degree fever, you won’t be able to survive that long with that type of temperature rise. And that’s exactly what’s happening in the oceans right now. I had no idea how significant the changes were that are happening in the ocean until working on this. IRA FLATOW: I’m Ira Flatow. This is Science Friday from PRI, Public Radio International. Talking with a new film called Chasing Coral. It’s going to be out on Netflix. When is it being released on Netflix? JEFF ORLOWSKI: It is live already. It went live this morning at midnight. IRA FLATOW: This morning. You sound very passionate about this, Jeff. How difficult was this for you emotionally to sit there and watch the coral dying before your very eyes? JEFF ORLOWSKI: Yeah, when Ruth was just sharing that about how the majority of corals would be dead in the next coming decades, it’s a sobering fact. And it is very sobering to witness this firsthand. Our team was out there, and we saw the pretty much complete death of this one particular reef system. It was about 90% to 95% of the corals in that area died in just a few weeks– under two months. And the changes were just so remarkable. None of us thought– I certainly never thought– that something like that could happen that fast. And the way we were documenting it, we were scuba diving every single day, slowly watching the deterioration of this ecosystem and realizing– most of the scientists, I mean, Ruth, I’m sure I don’t want to speak on behalf of you– but most of the scientists that we’ve met have been working on this ecosystem, because they love it, because it’s so beautiful, because it’s captivating. It’s magical. These corals are these amazing creatures. This project was such a challenge emotionally to get really immersed into this landscape, to see these beautiful ecosystems, and then in an odd way our job was to document its very death and destruction. And that was a huge emotional challenge for our team. IRA FLATOW: And Ruth, what can people do to be most effective? RUTH GATES: Yeah, to be most effective, I think people just really have to embrace solutions that fit with them. So don’t go on a transatlantic flight. Embrace renewable energy. Lobby your local governors. I mean, really the people in charge– start to really activate from the ground and say, we demand a change in the way that we are using fossil fuel. The change is going to come from the ground, and it will force the powers that be to make major shifts that will influence our environment and our climate, as we move forward. And everybody can engage in that part. Everybody can be a part of the solution. And I think that’s the wonderful thing about this problem of climate change. It is a solvable issue that everybody can be a party to, and in some ways, it creates the greatest challenge of our time. And I think that humans are incredibly good at solving problems, and so we just need to activate and do it. IRA FLATOW: If you need some motivation, check out the film Chasing Coral. It’s on Netflix, director Jeff Orlowski. Thank you for taking time to be with us today, and it’s a great film. Thanks for making it. JEFF ORLOWSKI: Thanks so much. IRA FLATOW: I remember my scuba diving experiences, and places I dived, they’re dead now, too. Ruth Gates, professor and director of the Hawaii Institute of Marine Biology in Kaneohe, Hawaii. Welcome and thank you for joining us on Science Friday. RUTH GATES: Thank you very much, Ira. IRA FLATOW: BJ Leiderman composed our theme music. Our thanks again to Neil Rauch, and Brian McCabe, and the folks at NPR for helping us this week. If you’d like to write us, you can send– yeah, the old fashioned method– Science Friday, 19 West 44th Street Room 412, New York, New York 10036. Of course, we’re all over social media. All week long, we’re taking our tweets at scifri and also on our website. And also of course, we’re on Facebook. That’s scifri. Have a great week. I’m Ira Flatow in New York.